Lilies have been adored and considered sacred plants in different cultures for centuries. Today, they are still on of the most loved garden plants. 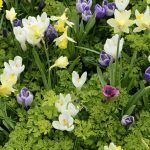 Their deeply rooted bulbs and wide array of color and variety makes them great companion plants for many annuals, perennials and shrubs. Read on to learn more about companions planting with lily flowers. Lilies grow best in full sun, but can tolerate part shade. They should not be planted in shade gardens or surrounded by tall plants that shade them out. Most lilies like moist, but not soggy soil; too much water can make the bulbs rot. Established lilies can be drought resistant. Good lily plant companions will have medium-light water requirements. Lily bulbs do not like to be crowded out, so aggressive spreaders and ground covers are generally not good companions for lilies. The following suggestions make suitable lily plant companions in the garden. Be sure to give lilies plenty of space of their own, and don’t crowd them with companion plants. Lily bulbs are soft and tender, and the strong, aggressive roots of other plants can pierce these bulbs, damaging or even killing them. Lilies also will not come up in the spring if weeds or plants are too dense above the bulb. If lilies are too overcrowded or over shaded, they can be more susceptible to fungal diseases.